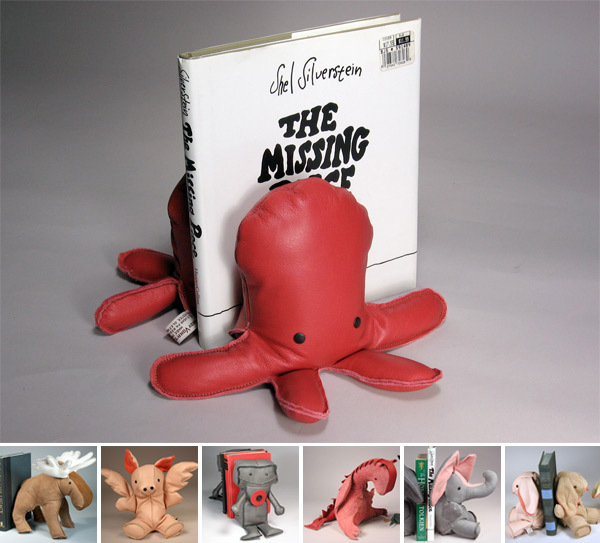 Sandy Vohr has been making the most adorable luscious little leather bean bag creatures for the last 30 years. In fact i think i even received one of her beautiful little leather frogs as a paperweight as a kid! The site even says, “The animals are made from cowhide and deerskin, and filled with various combinations of fiberfil and beadlike materials.” When i spotted the Bunny Bookends at Barneys, i got nostalgic and ended up looking up Sandy’s site… where i discovered so many new adorable leather creatures ~ from moose to dragons, robots to octopi! See some of my favorites on the next page! Looks like she’ll even do customs! 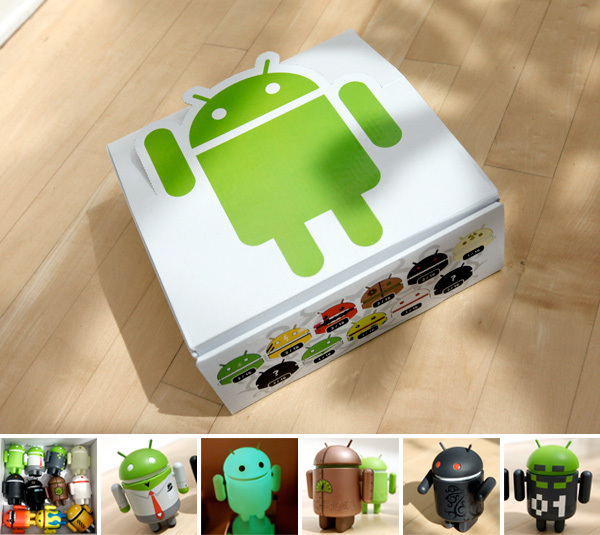 Andrew Bell’s DYZPLASTIC Android toys are finally here, and i’m a little obsessed. They are ADORABLE. And oh so detailed in all the right ways… and that glow in the dark radioactive one… just stunning. And how some have arm tattoos… or cufflinks… or tramp stamps… or awesome logos… and swirls in the eyes… you really must see them all! Also as much as i can’t stand blind box toys conceptually, i do adore that 5 year old feeling of joy when you sit and tear through a case of little boxes and their foil wrapped innards. Take a peek at all their close ups on the next page! Including two of the secret chase characters! p.s. 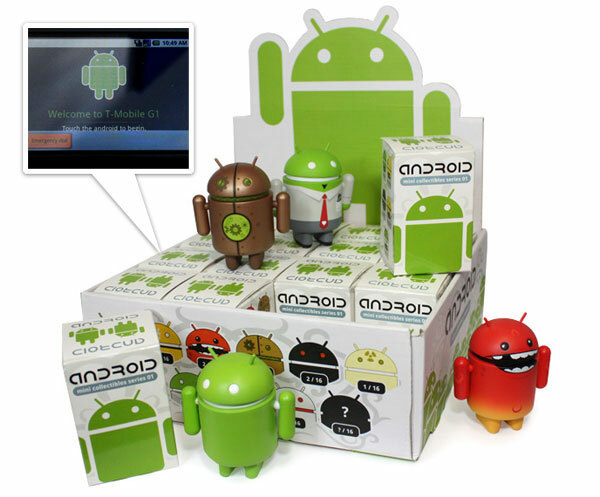 as i play with these, i can’t help but wonder, why don’t more OS’ have awesome little mascots? p.p.s. 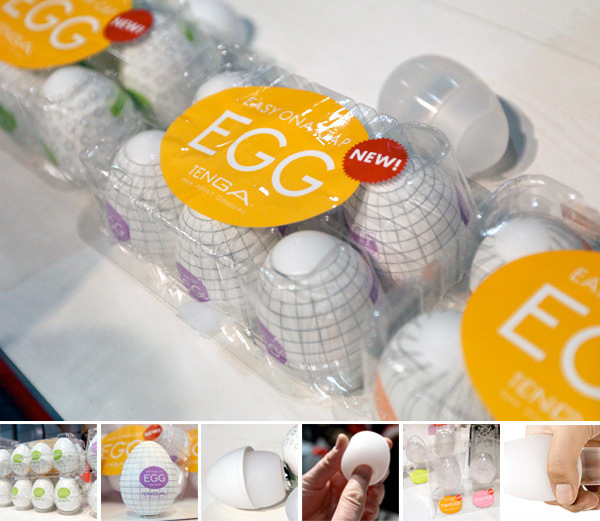 Soooo, it sounds like demand has FAR exceeded expectations ~ which is awesome! Unfortunately that means these little guys are hard to get your hands on. However, Andy wanted me to assure you that there will be more Series 1 available this summer ~ which really is just a blink away… so sit tight, and/or grab some when you see them! 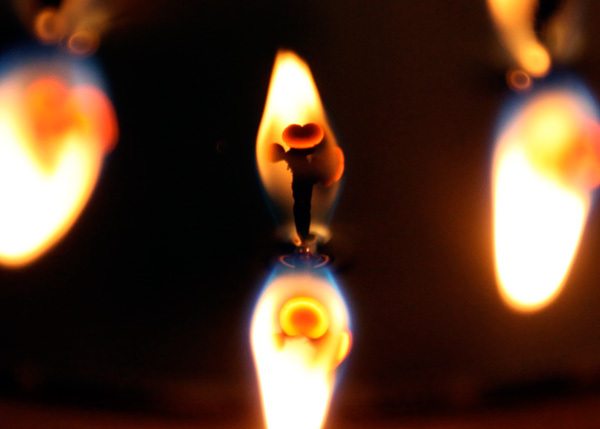 On random saturday night inspiration ~ while hanging out at a friend’s i got mesmerized by the way the wicks were burning… and the crystal clear reflections of them in the melted wax… and then i couldn’t help taking a bunch of pics! Tops! They are universally mesmerizing! 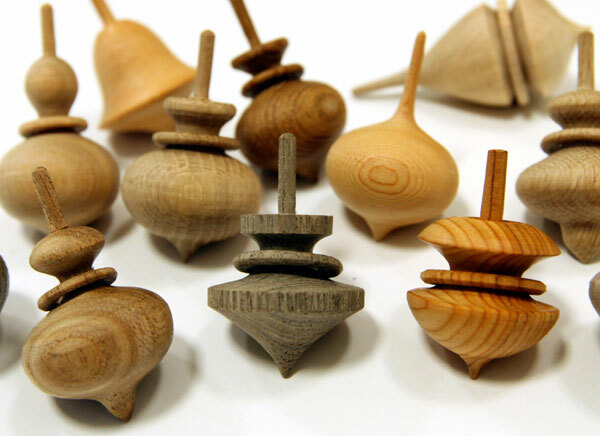 Regardless of age, they will definitely amuse… so imagine how my eyes widened when i came upon a huge bowl of these small wooden japanese spinning tops at Tortoise in Venice Beach… i kept going through the whole bowl ~ one by one ~ and slowly ended up buying a dozen. They were all so different! So hard to resist! And many have these floating rings carved into them that float as they spin… and they make the most amazing sounds… when still, the curvatures in your hand are just so beautiful… and then get them spinning, and it’s hard not to just watch them for ages… see the videos and more pics on the next page! 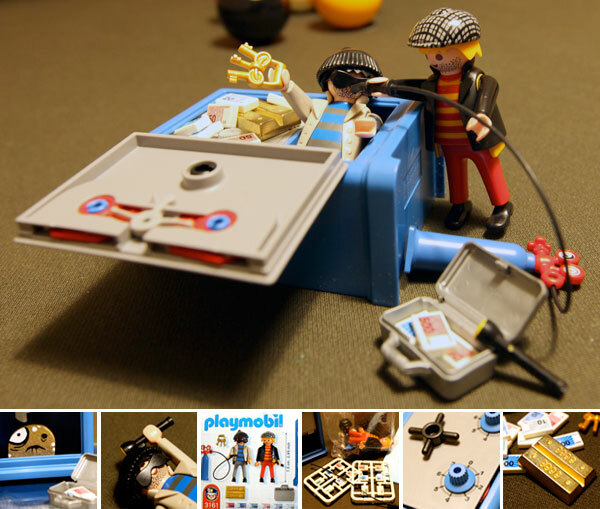 On random design inspiration ~ Playmobil seems to have evolved quite a bit since i was a kid. We had the zoo, rock climbers, fancy dressed victorians with car, the teepee, and farm animals… but definitely no disheveled stubbly striped shirt, sport jacket, sunglass, and beanie wearing safe crackers… these guys even come with graspable money, a canister with hose to freeze the lock(? ), silver suitcase, keys, flashlight, and even a weighty metal gold bar… best part of all, the safe is actually lockable! You can set the combination by picking two numbers… and it actually clicks as you rotate the dials. 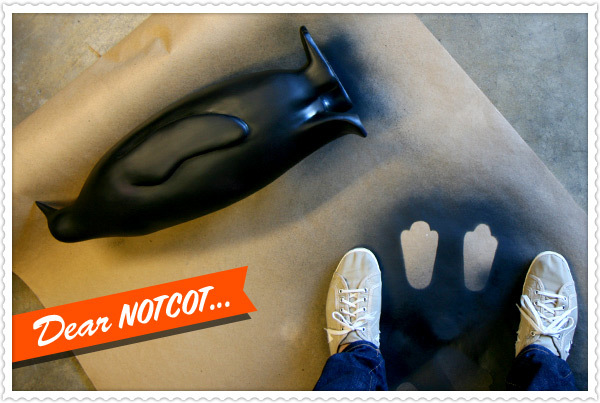 While i’m a bit swamped in the UK ~ Linhchi has been playing with the penguins at my house in LA… and put together our second “Dear NOTCOT,” postcard! 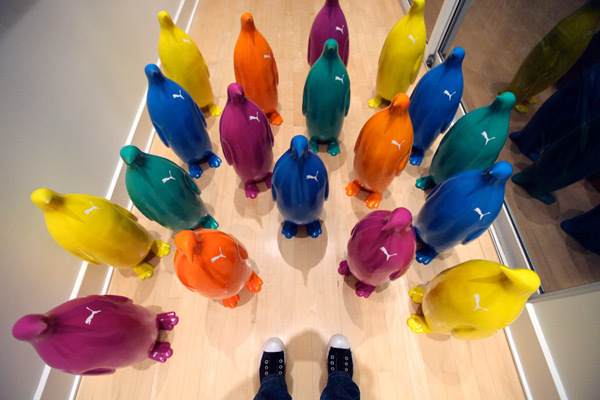 The first part of the evolution of this particular magenta penguin started here. See the details of her latest adventures with the penguin on the next page! 4. On the twitter account you can find the link to The White Rabbit Inc, a detective agency of course. The man-rabbit is there again teasing you to follow. 5. Clicking him takes you to Wonderland Tea Shop, where he causes some havoc and teases you to follow once again. 6. Now you end up at the Happy Hearts Casino, faced with an eerie Kathy Bates Queen of Hearts backed by some show girls… and he escapes again, waiting for you to follow. 7. Where you finally land at Syfy’s Alice. I can’t help but wonder, what’s next? Where can i get a Rabbit mask? Will the miniseries live up to the campaign? There is so much talk these days of ways to integrate social media, ways to use twitter, how to innovate on really engaging people (in both real and online worlds) for campaigns… and i’m loving what Fallon and Syfy have pulled off with this one. With so many ideas floating around, they’ve definitely taken it further than most would expect, and it feels like everyone has had a blast doing it! 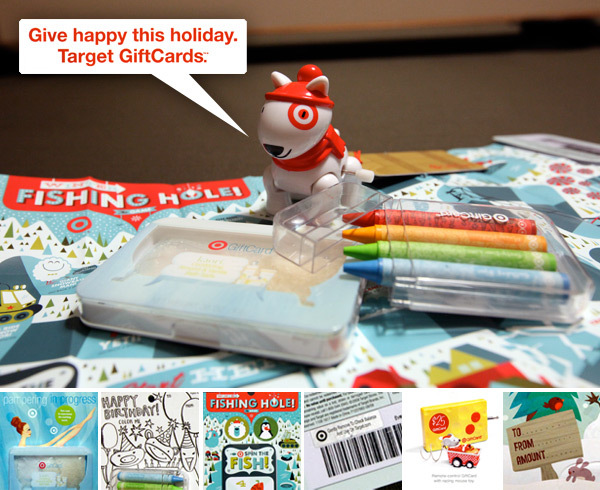 So take a peek to see the different parts of this campaign (and a fun video too!) on the next page! Did you see him running around last night? Love this video of the projection of the White Rabbit running through NYC… Fallon has really gone all out with a Syfy for their latest flick, Alice! 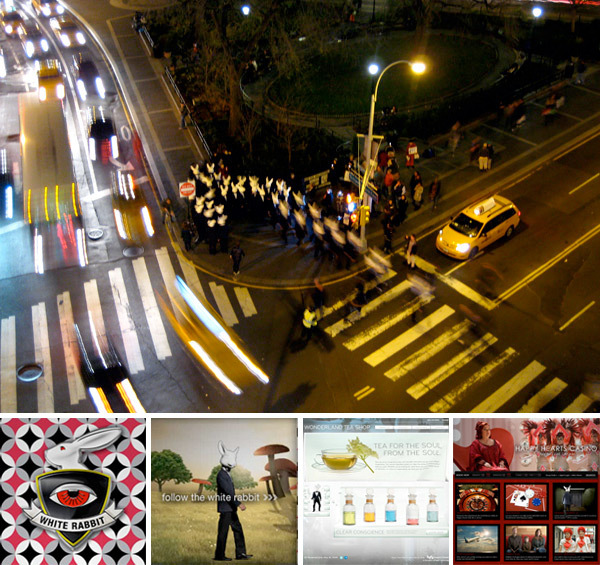 (Can’t wait to check it out on sunday)… before i share more of the campaign, check out more pics! Or perhaps some of you in NYC even saw him running around today? 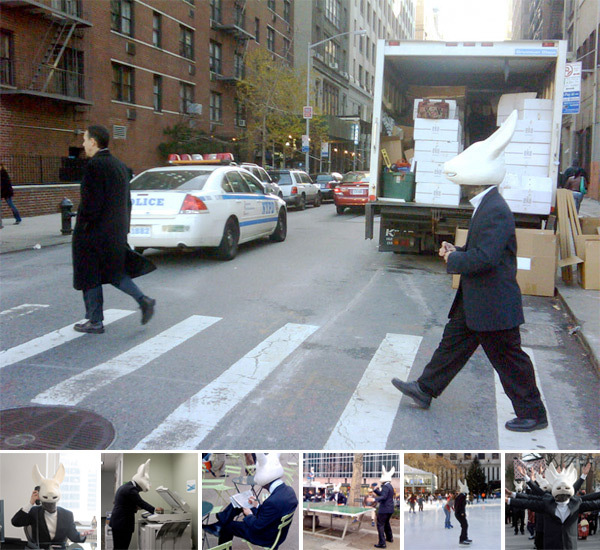 Before i even begin to show you what else i’ve found, let’s just take a look at these really fun and surreal pics of a day in the life of the White Rabbit… See pics of the White Rabbit/s doing everything from sitting in the office, to photocopying, to doing the crossword, to ice skating… and more! on the next page. p.s. if you want to see the whole campaign check this out. 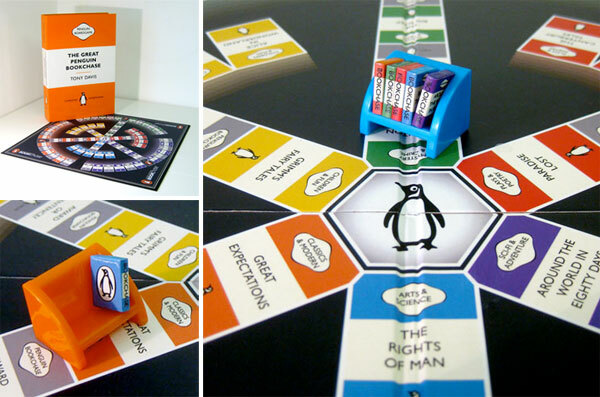 For those who love books, what a perfect boardgame to gift! I forget who first sent this to me, but i’ve had these pics waiting in photoshop on the desktop for some time now! Have you played Bookchase? While the original wasn’t as visually appealing to me, i have always loved the look of penguin classics, and these adorable little penguin books on shelves with the penguin covers on the board… so cute. All packaged in a giant book of course! So here is The Great Penguin Bookchase! Here’s the official description “The fist edition of BOOKCHASE® was launched at the Hay International Literary Festival in 2007, to rave reviews. Bookchase is the perfect game for anyone who has ever read a book. The game can be played with questions or without - fast or slow. Ever dropped a book in the bath, or lent a book to someone and never got it back?? 2-6 players aged 6 and upwards - the perfect family boardgame. 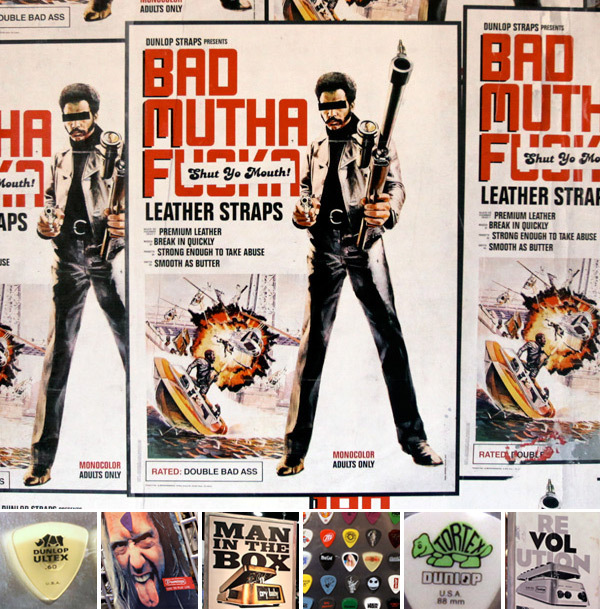 First to collect, beg, borrow or steal 6 books is the winner.” See more pics on the next page!